Obituary – Willems, Elizabeth Ann (Treeman) « Perry High School Alumni Association, Inc.
﻿- daughter of Mr. and Mrs. Ralph W. Treeman was born October 31, 1918, in Perry, Oklahoma. She has attended Perry Public Schools. While a student in Perry she was president of the Student Council, appeared in the following plays: “The Man Higher Up,” Junior Play, Senior play, both all school plays, Senior Pageant for two years, President of the State Honor Society two years, and the National Honor Society two years, member of the Red Hots four years, member of the glee club for 3 years, appeared in the operettas 3 years, member of the Journalism Club, member of the staff of the “Booster,” and was president of the Student Council her Senior year. Miss Treeman plans to attend Park College in Parkville, Missouri next fall. She is especially interested in journalism and dramatics. She is interested in swimming, basketball and tennis. 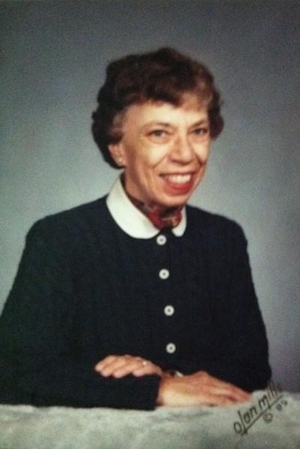 Elizabeth Treeman Willems died at her home in Perry, Oklahoma on January 22, 2013. She was born to Ralph W. and Irene McCune Treeman on October 31, 1918. She was the daughter and grandaughter of Perry Pioneers. Both her grandfathers, McCune and Treeman, made The Run into Perry on September 16, 1893. As a child, Elizabeth attended Perry schools, and when she learned to read, the course for her life was set. Following graduation as valedictorian from Perry High School, she pursued a degree in English at Park College in Parkville, Missouri. While in college, Elizabeth was very active in numerous student organizations and served as editor of the student newspaper. Upon graduation with honors from Park College in 1940, Elizabeth accepted a scholarship to pursue a graduate degree in English at Washington University in St. Louis, Missouri. In 1943, Elizabeth enlisted in the WAVES (Women in the Naval Reserve) and attended Officers Training School. She was commissioned Ensign in the Naval Reserve and was assigned to the Naval Shipyards in Baltimore, Maryland. She remained in her position there until the end of World War II. She was discharged from the Naval Reserve after attaining rank of full Lieutenant in 1945. She returned to Perry and soon after began graduate studies at the University of Oklahoma in Norman. While there, she applied for a program in book editing at Radcliff College in Massachusetts. She was accepted to the program and ultimately was chosen to become an Associate Editor of the Harvard University Press. While working at the Harvard Press, Elizabeth met a young man from Holland, Kees Willems, who was doing graduate work at Harvard. Upon completion of his graduate study he had to return to Holland, but not before he and Elizabeth became engaged to be married. In 1953, Elizabeth sailed for Amsterdam, and in April of that year she and Kees were married. Elizabeth loved living in Holland for the next twenty years, learning the language, becoming part of the Willems family, editing and translating art books for Abrams Publishing Company of New York in their Dutch offices in Amsterdam. Elizabeth was fascinated by all the wonderful museums and galleries and the interesting people she met and with whom she became friends. In the 1970’s, she and Kees parted, and Elizabeth returned to the United States where she continued to edit and translate books for Abrams. She regularly returned to Amsterdam when her work took her there, as she still loved Holland and her Dutch family and friends. Once back in the United States, she made her home in Perry. While living in the hometown she loved, Elizabeth served the community in a number of ways, including: Elder on the Session of First Presbyterian Church, and on the boards of The Carnegie Library, The Cherokee Strip Museum of the Oklahoma Historical Society, and The Stagecoach Theater. She was honored as the Outstanding Woman of Perry, Oklahoma by Beta Sigma Phi Sorority and as Outstanding Graduate and Alumna of Perry High School. For much of her life, Elizabeth was a devoted citizen of Perry, Oklahoma and wanted to strive to make Perry The Best Small City on the Prairie. Elizabeth was loved and treasured by her family. They have wonderful memories of Elizabeth’s love for books, many of which she shared with friends and family; her flair for the dramatic, even pursuing acting at the Stagecoach Theater; the poetry and witty verse she wrote for every family occasion; and her penchant for lively discussion about everything from the latest New Yorker article or cartoon, book or political event to her dogs, good food, and favorite television show. The family wishes to thank those who lovingly cared for Elizabeth in her final years for their dedicated service: her friend and geriatric manager, Charlotte Ream Cooper; Dr. Blake Baird; and her devoted and faithful caregivers, Cecil Shields, Patti Jordan, Marti McConnell, Merri Stafford, and Christina McConnell. A Memorial Service to celebrate Elizabeth’s life is to take place on Saturday morning April 13, in Perry. The service will be conducted by The Reverend Dr. Ann Irene Hoch, Memorial Presbyterian Church, Fredericksburg, Texas, niece of Elizabeth. Elizabeth was preceded in death by her parents and her eldest nephew Jeffery Clay Treeman. She is survived by her brothers Ralph W. Bill Treeman and his wife, Maxine, Tulsa, OK.; John L. Treeman, Claremore, OK; and sister, Frances T. Hoch, Oklahoma City, OK; and many nieces, nephews and friends.